We first became aware of Matt Howden when he appeared as violinist on Tony Wakeford's Cupid & Death. He has since appeared on most subsequent Sol Invictus releases and accompanied them on many live shows, in addition to performing on other Tony Wakeford related projects. Outside of the confines of Sol Invictus Matt Howden recently collaborated with Tony Wakeford on Three Nine a recording devoted to the runes, Thurisaz and Hagalaz. Together with his wife Jane, and fellow-Sol member Sally Doherty, Matt Howden also records as Sieben. Forbid The Sun's Escape, their debut release, is a beautifuly arranged album of female vocals over a fragile backdrop of flute, violin and bass guitar. Earlier this year the illustrious Matt Howden released his first solo CD, Intimate and Obstinate a collection of seven compositions recorded using both natural and electronic instrumentation. Compulsion online met Matt Howden via email and below are Matt's responses to the questions we set him. compulsion: Please could you provide some background on yourself? Who is Matt Howden? I'm a musician, I play various instruments, but usually just violin or mandolin live. I have various guises, projects and bands. (see later). I'm also a producer of music, working with bands and artists, and doing re-mixes in my own studio, redroom, and have just started my own record company, redroom label. I don't know what I am! compulsion: You are presently a member of Sol Invictus. How did you come to work with Tony Wakeford in Sol Invictus? What's it like to work with a tyrant such as Herr Wakeford? I met Tony in 1995, through Karl Blake, who was stalking the women in my band at the time (!). He introduced me to Tony and arranged for me to do some violin on Cupid & Death. Tony isn't such a tyrant to work for; he lets us out of 'the dark place' at least once a week, and even sometimes allows us food or water. Actually it's not that bad, and we share the same interests of music and good food! compulsion: Together with your wife Jane, and Sally Doherty you also record as Sieben. How did the project originate? Could you tell us about Sieben's debut album Forbid The Sun's Escape? The idea for Sieben came to me whilst playing in Leipzig with Sol (in 97 or 98, can't remember) I decided to do a project using Jane's voice. Later I found out that Sally was also planning a new project, and decided it would be great to combine her voice with Jane's. Their voices have very different properties, and are very complementary. Forbid The Sun's Escape was started with a song called "No Tears" which I wrote, and then Jane and Sally added their own parts to the basic song. Things evolved like this, and we developed an identity, and a way of working during the writing of the album. It has been strange recently, because we've been rehearsing for our first ever Sieben concert (Leipzig Wave-Treffen Festival, Sat June 10th, at the Volkerschlachtdenkmal) and had to re-learn all our parts for the songs by listening to the CD to see what we did! compulsion: Could you briefly describe your other (numerous) projects? I play violin for a band called the Raindogs, who are based in Portugal. We're sort of like the Tindersticks, or Tom Waits in style. The band members are Portuguese, Venezuelan and German. Our last album was produced by Chris Eckman from the Walkabouts, who is really good to work with. We recorded the album in an old cinema across the river from Lisbon, with a great view of the city. Other than that, I play electric mandolin in another project with Jane, called Stiki, which is quite electronic, with her heavy bass, and my distorted wah-wah mandolin. We've been going for a while but not had time to do anything for ages. compulsion: What made you decide to strike out on your own with the solo CD, Intimate and Obstinate? I wanted to do a CD that was entirely how I wanted it, without thinking about who would release it, buy it, or anything like that. I didn't set out with any intentions of how the album or the pieces would sound. It was pretty liberating really. Intimate & Obstinate developed it's own sound, and it's own style as it went along. I merely followed the path that the music took me. compulsion: In the liner notes you mention the obstacles involved in recording using 'natural' and electronic equipment could you provide a rough outline of your approach to composing? It's different every time, and I try and keep it that way with the different projects I do. With Intimate & Obstinate I recorded long passages of violin, and culled most of the take, leaving behind just the fragment that was special. I repeated this endlessly until I built up the pieces, and then shaped them. I also ended up wandering round my studio, trying to find specific sounds to fit the pieces. I used everything that sounded right, from the body of the violin for percussion, time stretched bass and strings, cans of hairspray, tupperwares; even the cat got recorded. compulsion: It's very classical in sound and construction, are there any specific composers who have influenced your work? What other artists do you admire? I love to listen to Mozart, and Arvo Part. But I like lots of different things. I must admit I don't seem to find a great deal of time to listen to other people's music, as I'm usually writing my own. I can get quite obsessive when I'm working on a piece, and have to force myself to leave it alone after a prolonged stint of working and re-working. compulsion: Three Nine, your current collaboration with Tony Wakeford involves musical structures and timings that conform to a three or nine-based structure. How difficult was it to compose? It wasn't. I love the mathematics of music, and the establishing of patterns within the music that then get subverted. With Three Nine I let myself get completely wrapped up in those kind of themes, and although I had to wrestle the pieces into shape (sometimes for a long time) I was always surprised when they suddenly dropped into place, and were finished. 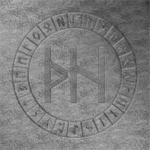 compulsion: Why did you decide to record a CD based on the runes Thurisaz and Hagalaz? What do the runes mean to you? That was Tony's idea, I must confess to not having any deep knowledge of the runes. I did want to capture the strength and power of an ancient force, in the music, and I hope that comes across. compulsion: How does this collaboration differentiate from your other work with Tony Wakeford? I think the sound is quite different. The pieces all interlock, there are three types of pieces all occurring three times to make nine pieces exactly thirty-nine minutes long. These are then combined into one nine-minute piece at the end of the CD. It's not like the other work I have done with Tony on Sol stuff, where it is more 'song' based. The next Howden/Wakeford album (already underway) will be more song based, but each song will also get the Three Nine treatment, being twisted and contorted to make another, instrumental version of the song. compulsion: You've provided music for short films, television and radio broadcasts, you're involved in the music groups The Raindogs, Stiki, Sieben, Sol Invictus and not forgetting your various solo and collaborative ventures, where do you find the time to pursue all these projects? Do you ever sleep? I try to, but there's a lot to be said for working in the night, with headphones on while people are sleeping. I try and record instruments in the day, always leaving something ready to be manipulated, or worked on at night, in case I get up and decide to do some more work. compulsion: Anything else you'd like to add? What's next? At the minute I'm busy with a few things: I'm preparing for the Sieben concert, and writing some new stuff for the next album. I'm also working on two solo album projects; Hellfires is almost half finished. Its going to have some heavy Wagnerian strings, and I'm also singing on it, it won't be instrumental like Intimate & Obstinate. I'm also working on another (probably double) CD called Voyager. (Think Holst's The Planets for the new millennium!) That won't be ready till June 2001. Aside from that there's just the small matter of another Howden/Wakeford album, a Raindogs album to be written, and quite a few Sol and Raindogs concerts. And I'm moving house…. The above CDs are available for sale from Matt Howden at Red Room Records. Links and contacts for further information on Matt Howden, Sieben, Stiki, The Raindogs can be found on the Matt Howden website.